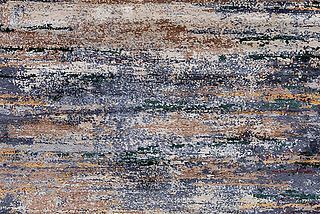 The design carpet SI37 from our Sichouk Collection combines pure silk and a fascinating play of colours to create a home accessory for highest demands. The classic design adds an elegant charm to the interior and offers exciting facets. The Sichouk SI37 invites you to discover its sophisticated appearance, which is characterized by a mysterious medallion. Everything you should know about this textile artwork made of pure silk, here in focus. The fact that the Sichouk SI37 is one of the peculiarities in Mischioffs new main catalog 2018/2019 is no coincidence. Colours such as sand, cream and deep claret create a warm atmosphere, which is in great demand when setting up inviting spaces. As the bright nuances clearly outweigh, a friendly overall impression is guaranteed. Attention draws among other things the orange accents, which were discreetly placed, but consistently found in the entire design. 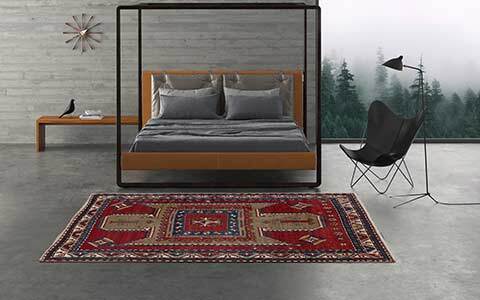 Like traces of small gold particles, they elegantly enrich the look of the silk rug. Equally evenly, different shades of grey are integrated. They create a delicate contrast and complete the harmonious colour scheme. All colours have been processed in such a way that they create an interesting course with a beautiful medallion. 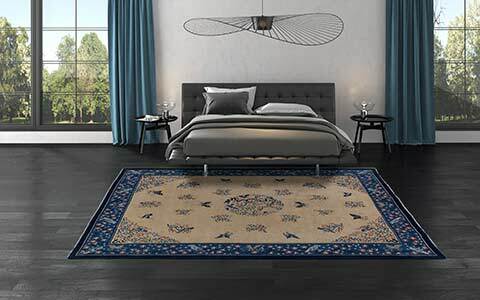 This turns the rug into a fabulous eye-catcher. The dark components make it easier for the viewer to capture the tasteful motif. However, the Sichouk SI37 does not just have much to offer visually. His inner values also impress: the processing of 100 percent pure silk produces an overwhelming shine. 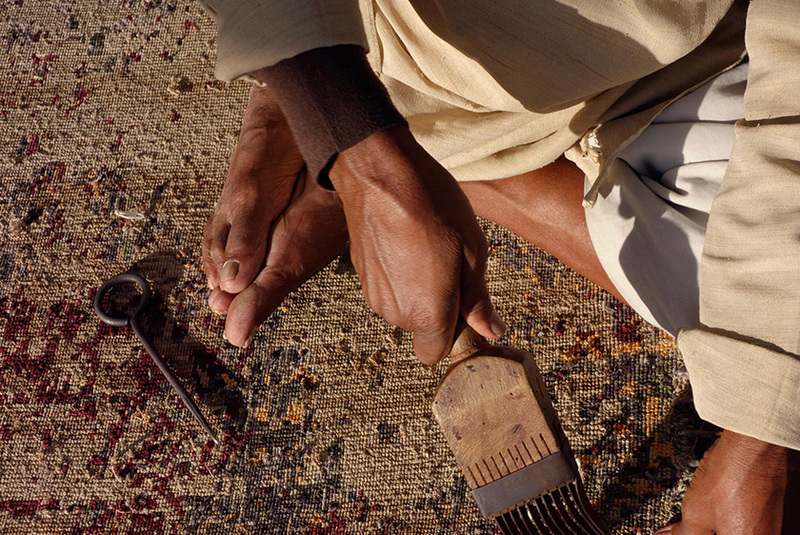 The fine silk fibers are knotted by hand and emphasize the carpet design skillfully. Ideal, for example, to stage the exclusive atmosphere of private residential buildings, hotels or architecture firms. 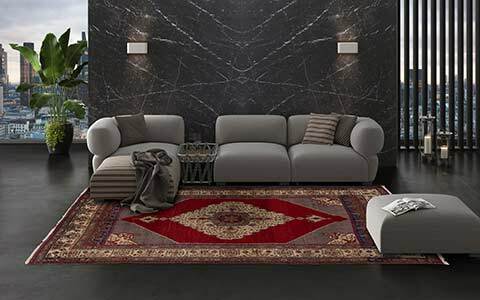 With about 160,000 knots per square meter and a pile height between eight and nine millimeters, you can look forward to a superior feel. In order to create the gentle silk pile in perfection, it requires people with experience who have the know-how and necessary tact. All Mischioff collections are made in our manufactory in Nepal by competent weavers. 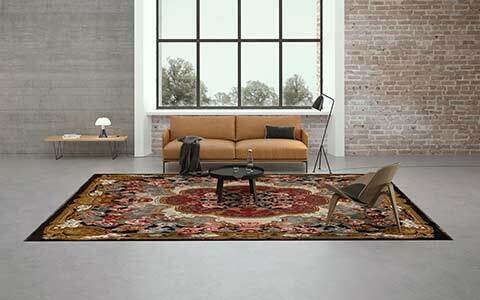 They implement the carpet design precisely and, with their skills, make a decisive contribution to ensure that every product becomes a piece of jewelry. We greatly appreciate this commitment. Cooperation under fair conditions is a matter of course for us. We pay fair wages and attach great importance to a familial approach. Mischioff fair trade production has already been confirmed by certification by the Fair Trade Label STEP. The independent label regularly controls the production. Also a sustainable use of resources as well as the avoidance of questionable substances are part of our philosophy. By buying our products you promote fair trade and take responsibility. Order The Sichouk SI37 Now! Complete your assortment with the SI37 from the Sichouk Collection with a quality product made of the best natural material. 100 percent silk speak for themselves and make luxury palpable. The excellent design makes rooms look more inviting and exclusive. Ideal for all industries that want to convince customers by a representative appearance. 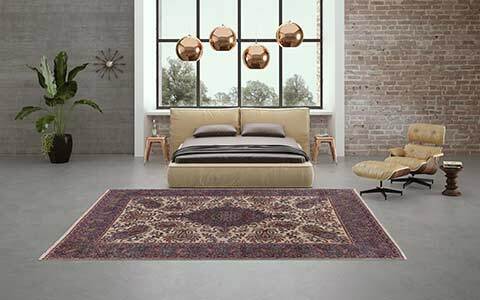 Whether professional carpet retailer, furniture store or architect, hotel industry, catering or real estate industry: The Sichouk SI37 sets standards. You have the choice between the standard dimensions 300 x 230 and 250 x 185 centimeters. Of course you can order also individual custom sizes. Let us know your demands – we are looking forward to your inquiry! You need more inspiration? Order the new Mischioff Catalog 2018/2019 for free and take a look at the highlights of our diverse collections! We ask private carpet lovers to look for regional distribution partners by using our retailer search. 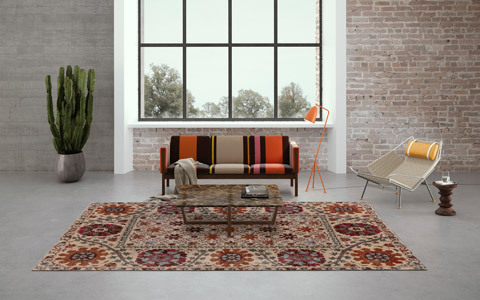 There you will be personally advised where to refer our rugs directly. Tip for staging communicative living oases: Combine the Sichouk SI37 with comfortable upholstered furniture. Avoid succinct patterns. These would distract from the artistic carpet and diminish the ambience. 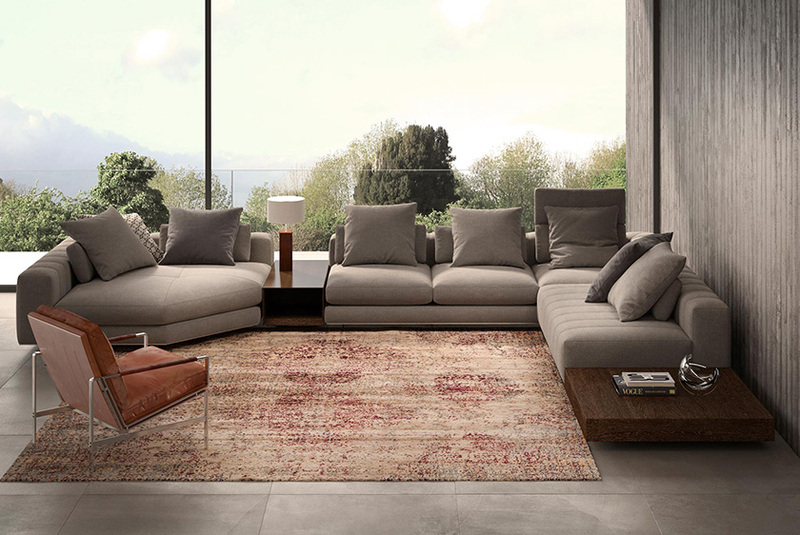 High-quality fabrics, leather and solid wood are perfect companions.